The first thing to remember when you are there standing in front of a mirror looking at your body trying to decide what body type you fall under is this:Nobody has a perfect body . That's right, NOBODY. I have never met a person who did not have something about their body that they didn't like. The trick of looking good in your clothes is as simple as finding out what body type you are and dressing accordingly. A lollipop of goblet shape is typically known as a top heavy type. A person with a top heavy shape has large breasts, big stomach, is short waisted with long skinny legs. 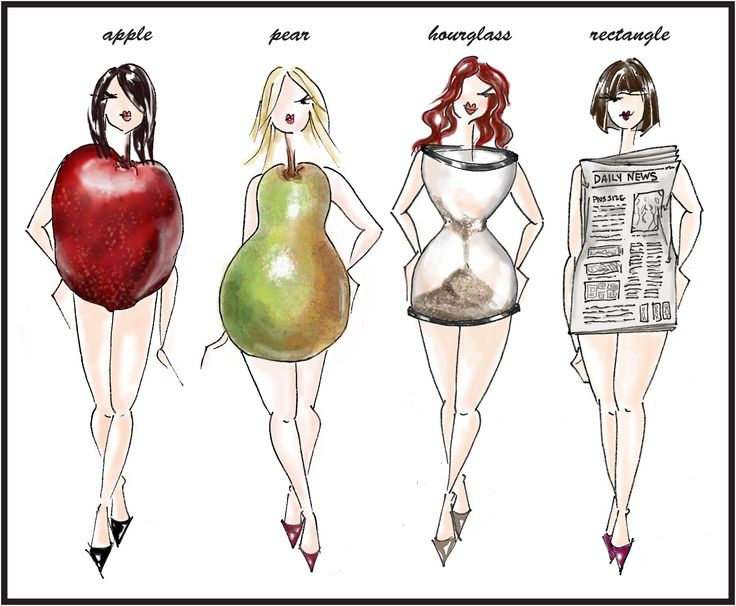 A pear shape body type typically has a long slender neck , small narrow shoulders, a small bust a nice shapely waist with hips that widen to saddlebags, a larger rear end and full thighs. The waistline of this body type is small and feminine, it should be accentuated. A diamond shape body type has narrow shoulders, small bust line, broad hips and larger thighs. This body type is lucky in that they get to wear the new style tops that accentuate their face and shoulders. The straight shape body type is just what it sounds like. The bustline and hips are equal in size. You have an average size bust, a large rib cage, a waist that is undefined, a flat bottom and nice slender legs. The slender legs of a straight body type are their best asset. Some people say this body type is as close to perfect as you can get. The person with this body type typically has a small bone structure. They have a nice sized bust, a defined waist, nicely curved hips, shapley and a slightly protruding backside. This body type has great curves that scream to be shown off. A person with a round shape has a larger bust, wide rib cage, a round fuller back, larger middle or waist, narrower hips and slender legs. The good news is the round body type usually has great legs and narrow hips that can be shown off to their advantage. This body type typically has broad shoulders, an average size bustline, an average size waist, narrow hips and nice shapely long legs. This body type can show off hip huggers to their advantage.